Phone numbers and forwarding can get complex, but we like to keep things simple. All of Call Tracking Pro features are included with your monthly packages. Custom plans are designed to fit your specific requirements for high volume clients. Our team will create a unique pricing plan to fit your business. Custom plans start at 50,000 minutes per month. Connect your Twilio account and take advantage of their rock bottom prices. Each additional Twilio account is only $10/month. What About Numbers And Minutes? We aren’t out to up charge you for phone numbers and minutes. Utilizing Twilio as your service provider, you can purchase numbers and minutes at market rate. 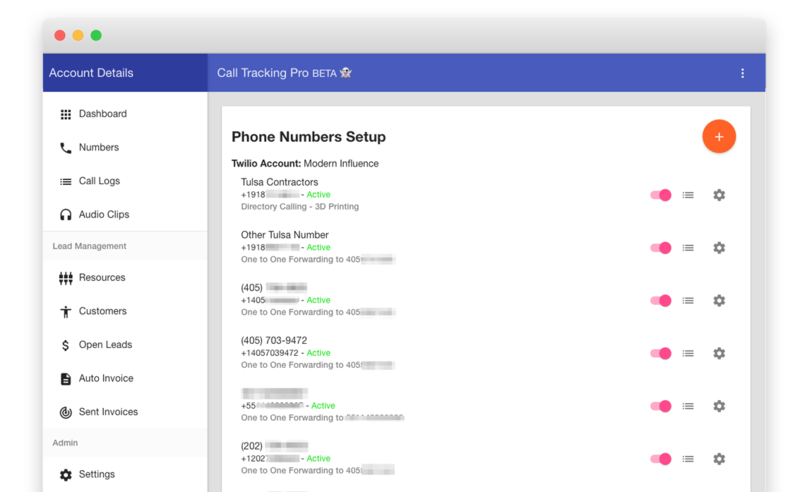 Our software integrates with the Twilio platform to optimize your marketing efforts through call tracking. Connect your Twilio accounts and take advantage of their rock bottom prices. Let us route all of your customer service, sales, and support calls to the right place. Call recordings are stored for up to 30 days with the option to download the call. Inform the company who the lead is and who sent it with a simple whisper integration. What is the difference between basic and advanced call forwarding? Basic call forwarding includes one-to-one call forwarding. A caller will dial one of your call tracking numbers and be directly forwarded to a number you specify. Each call can have a call greeting, a message the caller hears when they first call your number, a call whisper, which the recipient of the call hears, as well as the ability to record the call. Advanced call forwarding allows you to direct a call to many numbers in a row or simultaneously. What is the invoice add-on? Our system allows you to specify what qualifies as a lead and then automatically invoice on a regular interval (weekly, biweekly, monthly) a customer for the leads generated through our system. This can be both with phone calls as well as form fills. Our invoicing system will generate a PDF invoice with customer details and email to the address specified. If you use Mailgun, you can enter your API credentials and we can send the email branded as your email. A call whisper is a message that is played to the recipient of a call. This could be to let them know that this call is from a lead company, this message could be to let them know which phone number the customer called. This can be a text to voice message or a customer uploaded message. What is sms forwarding, or text verification? Many times there is a need to verify a phone number by text message. With this feature, we will automatically forward the sms messages that come into the system to the email address, or email addresses specified for forwarding.